MICHIGAN STATE (US) — Training young children in spatial reasoning can improve their math performance, according to a new study. The researchers trained 6- to 8-year-olds in mental rotation, a spatial ability, and found their scores on addition and subtraction problems improved significantly. The mental rotation training involved imagining how two halves of an object would come together to make a whole, when the halves have been turned at an angle. 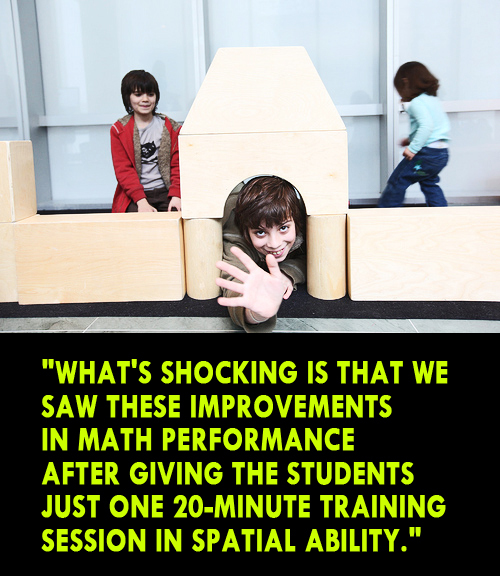 Past research has found a link between spatial reasoning and math, but the new study is the first to provide direct evidence of a causal connection—that when children are trained in one ability, improvement is seen in the other. The findings are published in the Journal of Cognition and Development. Kelly Mix, professor of educational psychology at Michigan State University, says the findings suggest spatial training “primes” the brain to better tackle calculation problems. Mix authored the study with Yi-Ling Cheng, a doctoral student in the College of Education. Understanding the connection between spatial ability and math, she says, is especially important in the early elementary grades because many studies indicate early intervention is critical for closing achievement gaps in math. Spatial ability is important for success in many fields, from architecture to engineering, to meteorology, according to a Johns Hopkins University paper. An astronomer must visualize the structure of the solar system and the motions of the objects in it, for example, while a radiologist must be able to interpret the image on an X-ray. Some education experts have called for including spatial reasoning in the elementary math curriculum. But there are many forms of spatial ability and Mix says it’s important to first figure out how each of them may or may not relate to the various math disciplines. To that end, Mix is leading a larger study that tests elementary students on different forms of spatial ability and math performance. The Institute of Education Sciences, which is the research arm of the US Department of Education, funded the research.